I am so completely bummed. 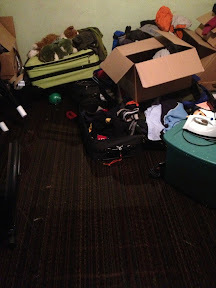 Our basement is terribly flooded. I had a relatively relaxing day. I did some school and then watched a movie with my littlest boys. I actually LOVE thunderstorms so I was hoping the weather would continue to be horrible all day. 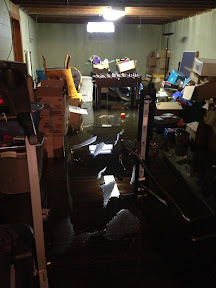 I knew at some point I would have to go to the basement to do my run on the treadmill. But I was in no hurry. I never gave the rain a second thought. 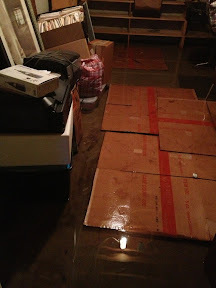 When we bought our house we had been told there were never any problems of water in the basement. Our house sits up on a hill and then slopes down in the backyard. 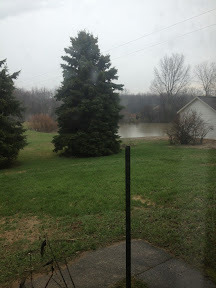 There is a pond behind the house next door but it is nowhere close to our house. Our backyard doesn't even have any standing water on it. 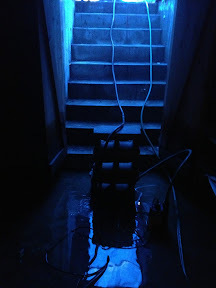 So I did not expect it when one of my boys tried going to the basement and said it was wet. I thought he was joking at first. But he wasn't. 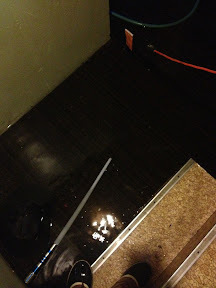 At least three inches of water covered every bit of my basement floor. I frantically started picking up things that would be easily affected- my big Epson printer, huge bags of fabric, my guitar, wood leaves to my dining room table. But most of those are just unimportant material things. My life will go on without them. What I'm most worried about? Photo albums. They are in a box some where down there. I still haven't found them. I'm hoping they are in a plastic tote, but I guess I will find out tomorrow. Another item is the boys' teddy bears. For each of them I got a special bear and took a picture of them with it every month of their first year. I've only found two. Another thing was my fabric measuring chart I made for the boys. I did find that. It was laying directly on the floor and was dripping wet. I have measured them every year and have written it down with a fabric pen. Some of those markings are faded but still readable. Thank goodness. It is now hanging up to dry. I had to put it into perspective because otherwise I would be a wreck. 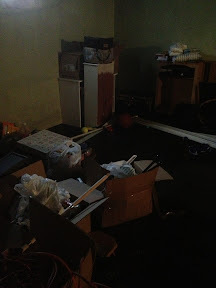 Most of the things down in my basement I can live without. But I am just praying extra hard tonight that the meaningful items will be kept safe until I can get to them.